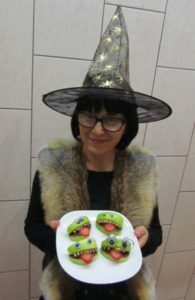 Smashtrash.ru Английский с удовольствием > Традиции и обычаи Великобритании > Halloween Time > Healthy treats for Halloween! Halloween is a great time for parties and trick-or-treat activities for children and grown-ups, too. 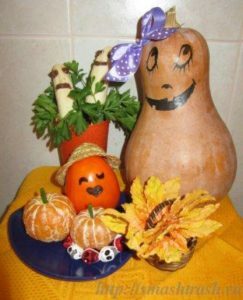 No matter how extravagant your Halloween affair may be there are plenty of easy food and decoration ideas, using a lot of things you may already have around the house. 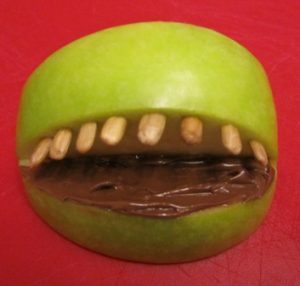 Why don’t try non-sugared healthy Halloween treats instead of candy this year! Of course, you’ll have much fun when you go trick-or treating but not so much fun for your body. 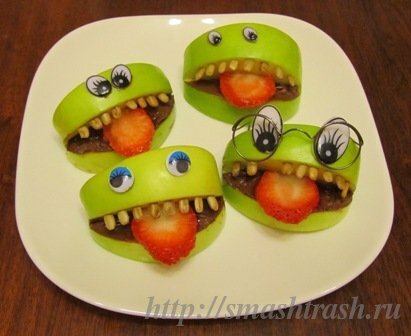 These cute little Fruit Monsters are not only adorable but also might be a healthy snack option for your Halloween Party. The kids always get a huge kick out of them. 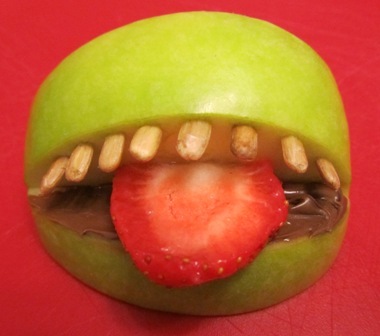 The benefit of fruit Halloween treats is obvious! Cut your apples in quarters avoiding the core, and then carefully carve the mouth out with a knife. You should be able to make about four of these guys per apple. Spray or rub them with lemon juice if you’d like to prevent them from browning. Spread peanut or almond butter on the inside of the “mouths”, mostly on the bottom where the strawberry tongues will be. Use sunflower seeds for the teeth. 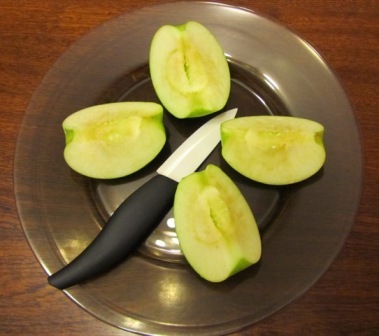 Gently push them into the flesh of the apples. Cut several strawberries length wise into little slivers to use them as tongues. Depending on the size of your strawberries you should get about 2 – 4 “tongues” each. 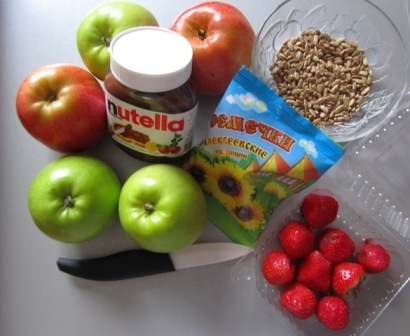 Place your strawberry tongues inside the mouths, using the peanut butter as glue. Now here’s the best part! 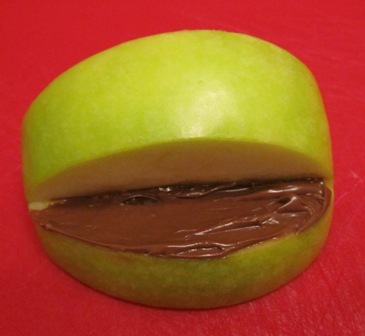 Use a little bit of your nut butter to glue on candy eyes. You can also cut mini marshmallows in half, and use a black food marker to make them look like eyes. I’m positively batty for these wickedly good desserts for a pumpkin-filled Halloween. They are ready to spook and delight your trick-or-treaters and guests. Get a pumpkin and draw eyes, a nose and a mouth with a black marker. To make it look funny, pin a beautiful bow in Halloween colours: orange, black or purple. Peel and cut into half some bananas. Add peanut butter to make their eyes and mouths. That’s it! Your ghostly bananas are ready! And how do you find this sweet persimmon bugaboo in a straw hat? It looks as if it fell in love with these two pumpkin like tangerines. Add some green parsley to freshen your treat. Good luck preparing and remember to be creative with your party planning! Don't let Halloween sneak up on you! Эта запись написана автором Елена Шрамкова, 22.10.2016 в 13:53, и размещена в категории Halloween Time. Следите за ответами на эту запись с помощью RSS 2.0. Вы можете написать комментарий или разместить обратную ссылку на своем сайте.